Chino Airport in San Bernardino County serves as the global R&D headquarters for Mooney International, a world-renowned manufacturer of small, single-engine aircraft. From rolled steel to precision satellite instruments, companies in San Bernardino County, Calif., make products that require a constantly evolving educational system producing best-in-class workers. 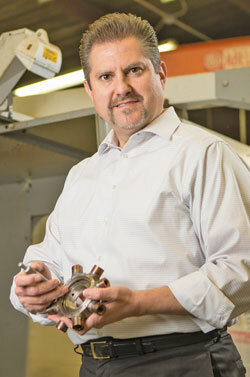 No one knows this any better than Mark Mahboubi, president of R&B Machine LLC in Upland. A manufacturer of high-tech space communications devices that are installed on satellites, R&B uses “very high-precision machines that require highly experienced workers,” says Mahboubi, whose 40-person firm is experiencing a 270-percent increase in sales this year. R&B relies on a variety of area institutions for equipping the company’s workforce. The National Tooling and Machine Association Training Centers of Southern California in Ontario, California State Polytechnic University in Pomona, and Harvey Mudd College in Claremont all produce graduates who go on to become trained technicians at R&B. that are installed on space satellites. Mahboubi says R&B could not do any of this work without access to the top talent in the world for working on machine tooling and precision instruments. “The labor market here in San Bernardino County is very large — around 1 million workers — and this gives us the ability to hire only the best of the best,” he adds. 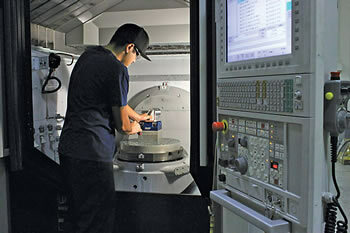 That is a refrain echoed by many executives at advanced manufacturing companies throughout the county. From the cities of Upland and San Bernardino in the valley to towns like Victorville and Adelanto in the High Desert, employers large and small say the overall business friendliness of the county — coupled with its highly competitive cost structure and logistics network — makes San Bernardino County the location of choice in Southern California. What enables them to excel, however, is the workforce. Yang says Chino is a “preferential geographical location for network and connection to Asia,” — a key factor given that Mooney’s corporate parent is based in Beijing. Founded by Al Mooney in Wichita, Kan., in 1929, the company today owns 132 world speed records, including the fastest transcontinental flight in a single-engine piston-powered production aircraft. R&B and Mooney have plenty of company in the rapidly growing aerospace sector in San Bernardino County. On the other side of the San Gabriel Mountains in the High Desert, Exquadrum Inc. is taking rocket science to new heights. Based in Adelanto, a community of 31,000 people in the western portion of the county, Exquadrum — which is Latin for “outside the box” — is considered one of the leading innovators in space launch vehicle design, liquid engine technology development, and satellite thruster technology. Eric Schmidt, president of Exquadrum Inc. in Adelanto, holds a new rocket injector made under contract to NASA on Exquadrum’s five-axis mill. Photo courtesy of Exquadrum Inc.
With 23 employees at Adelanto and nearby Victorville, Exquadrum is outgrowing its space and is in need of a 40-acre parcel for expansion, notes Schmidt. Aerospace firms aren’t the only manufacturers growing in the county. Makers of furniture and steel are expanding as well. Consider the case of United Furniture Industries Inc.
Four years ago, the East Okolona, Miss.-based furniture maker selected the Southern California Logistics Centre in Victorville for a 505,192-sq.-ft. manufacturing and logistics plant. Today, that plant employs 300 workers and is still growing. — Brett Guge, executive vice president of finance and administration for California Steel Industries Inc. in Fontana, Calif.
Across the mountains in Fontana, the largest steel manufacturer on the West Coast continues to grow. California Steel Industries Inc. started with 300 employees in 1984 and is now up to 1,000 workers. The San Bernardino County location gives CSI great access to the Ports of Los Angeles and Long Beach, notes Guge. “About 95 percent of our incoming steel slabs come from the Ports of LA and Long Beach,” he says. Through a unique partnership with Chaffey College in nearby Rancho Cucamonga, CSI is establishing a new on-site training facility that will equip the company’s future workforce. A $15-million federal grant administered through the US Department of Labor is funding the project. The only such grant awarded in California, the money will pay for construction of a training center on CSI property. Slated to open on August 1, the facility will train workers in electrical, mechanical and electronic control jobs, as well as computer technicians, machinists and welders. CSI recently expanded by adding a $100-million pipe mill that began taking orders in late 2014. Chaffey College, with 20,000 students, is one of the most important community colleges in Southern California. Critical to the workforce, Chaffey provides the kind of technical training that employers like CSI rely upon to keep up with ever-increasing demand for workplace skills. Chaffey College is part of the Inland Empire Regional Training Consortium, a partnership among 10 community colleges serving the region. These schools also include Barstow College, College of the Desert, Crafton Hills College, Mt. San Jacinto College, MiraCosta College, Norco College, Riverside City College, San Bernardino Valley College and Victor Valley College. Also part of the consortium are CSU-San Bernardino and UC-Riverside. The IERTC is a regionally coordinated, large-scale effort to develop the highly technical workforce necessary to advance industry in the area. Educational programs and certificates are aligned with the National Association of Manufacturers and the Institute for Manufacturing. Many employers in the region — including CSI, Ashley Furniture and Southern California Edison — participate in the partnership. James Ramos, supervisor of the Third District and chairman of San Bernardino County government, says that “the countywide vision provides for cradle-to-career education and training. We believe in early intervention. It is part of our strategic plan. This Investment Profile was prepared under the auspices of San Bernardino County government. For more information, contact Larry Vaupel, Economic Development Agency Administrator, at 909-387-9801 or by email at Larry.Vaupel@eda.sbcounty.gov. On the Web, go to www.sbcountyadvantage.com. 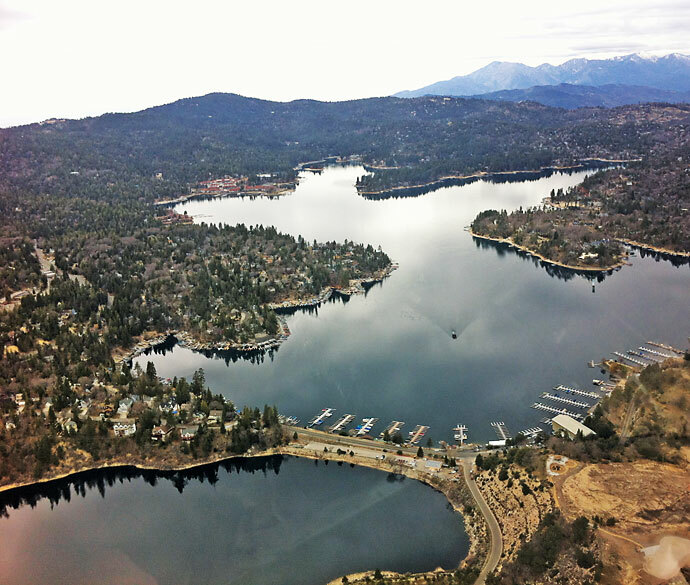 The San Gabriel Mountains form a stunning backdrop to scenic Lake Arrowhead, one of the leading tourist destinations in Southern California.